I bought this Gap sweater at the end of the season for like $4. I love gray and I love stripes so this was right up my alley. I was just starting to look full on pregnant with Baby 2 and wore it once before it got too warm and I got too fat. 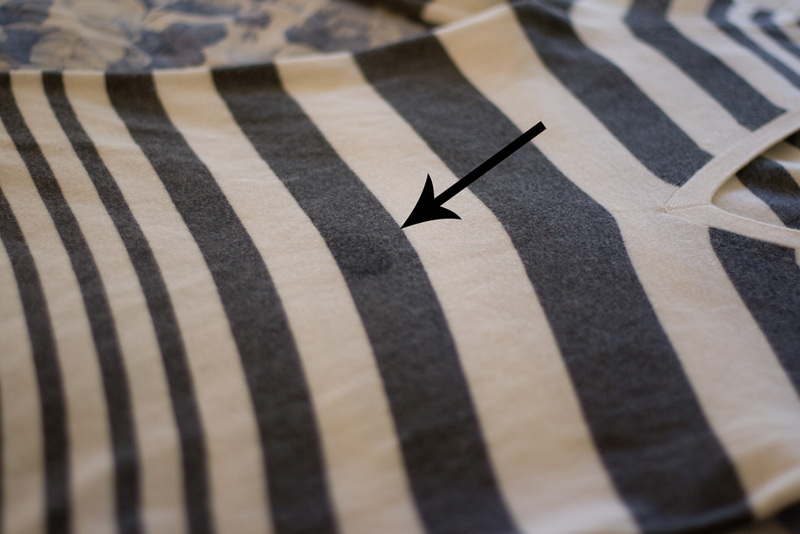 When I pulled it out a couple weeks ago I was incredibly annoyed to learn that during that ONE WEAR I managed to get a grease spot on the belly. I don't know what my problem is but I ruin a ton of clothes that way when I'm pregnant. Something somewhere is really greasy and I can't keep my fat belly out of it. Unfortunately, the placement is such that an embellishment would be weird. A flower up by your neckline? Cute! A flower smack dab in the middle of your belly? ....kind of odd. I initially tossed it in my fabric pile thinking maybe I'd make a stocking out of it for Baby 2. But then along came Kathleen of Grosgrain's Embellish Your Knits month. I didn't do anything real fancy like most of her awesome re-dos but she gave me the ideas I needed. Turning the thing into a cardigan allowed me to cut right through the grease spot and fold it under as part of the hem. A little lace around the edge allowed me to cover up my heinous stitching (she makes it look really easy. That's because she's perfect. I suspect witchcraft). 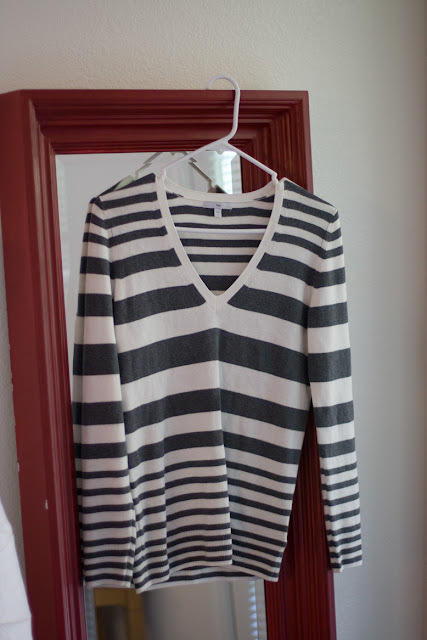 I also bought this sweater in a pink and cream stripe. I have some frilly cream colored lace I got in a grab bag at GW. I am seriously tempted. I love the re-do, but if that weren't an option and you have a grease stain, I swear by Goop. It's a mechanic's hand cleaner that works fantastic-ly on all kinds of stains, but especially grease stains. And now pulling out about eight things to fix. Am majorly indebted to you for sharing that blog. brilliant - it looks so cute. also! our tree was only $20 at home depot! it's little, though. i think the larger ones were $30-40? Oh my gosh, I'm obsessed with Kathleen's blog. I don't think she's a real person... she seriously has some magic hands or something because everything she makes is just PERFECT. I love what you did with the sweater! It looks awesome, and 10000x better than anything I could ever do! Hey there! I love your site, I found it from Momma Go Round and I have featured this post on my blog today! I am excited to go home and try this tonight!